I remember that at the start of the pokemon the anime, Professor Oak said that there are a lot of Gyms across the region. You only need 8 to enter the Pokemon league, thus Gary have 10 gym badges. However, no matter who I ask, no one seems to remember this or heard of this. I watched pokemon in Chinese sub with Jap voice. so did I remember wrong or something else happened? No. The pickle Tickler has essentially lists the gyms from the games, which are correct. The Pokemon Anime however doesn't follow them. We know this because as you said, gary won 10 badges in the anime. And that is without the Earth Badge. Hence there were ATLEAST 11 gyms in Kanto region. Alot of other characters in the anime like rivals have been shown with different badges that ash hasn't had. I this shows there are gym all over the region in the anime but you only need to defeat 8 gym leaders to enter the league. Ash, misty and brock have also met other non-game gym leaders in the anime like Dorian from the coastline gym in johto. Barry, Morrison and Trip have different badges too. Also note, Candice says that not many people come north to challenge her. Does that mean only people that beat her go to the Sinnoh League? Ergo, Sinnoh has more Gym options too. The reason Ash battles only the game Gyms is to reduce confusion and have people look forward to the other Gyms. Otoshi's Gym Badges: most completely different than normal ones. No, not all of the Pokemon regions have eight gyms. Most, however, do have eight. The only region that doesn't have eight gyms is Unova, which has 11 gyms. The specific gyms in each region can be found here. There are six regions: Kanto, Johto, Hoenn, Sinnoh, Unova, and Kalos. The Kanto region has eight gyms, including Pewter, Cerulean, Vermilion, Celadon, Fuchsia, Saffron, Cinnabar, and Viridian. The Johto region has eight gyms, including Violet, Azalea, Goldenrod, Ecruteak, Cianwood, Olivine, Mahogany, and Blackthorn. The Hoenn region has eight gyms, including Rustboro Dewford, Mauville, Lavaridge, Petalburg, Fortree, Mossdeep, and Sootopolis. The Sinnoh region has eight gyms, including Oreburgh, Eterna, Veilstone, Pastoria, Hearthome, Canalave, Snowpoint, and Sunyshore. The Unova region has eleven gyms (3 more than all the others), including Striaton, Nacrene, Aspertia, Virbank, Castelia, Nimbasa, Driftveil, Mistralton, Icirrus, Opelucid, and Humilau. The Kalos region has eight gyms, including Santalune, Cyllage, Shalour, Coumarine, Lumiose, Laverre, Anistar, and Snowbelle. 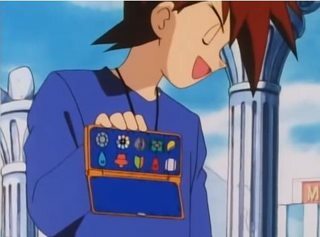 Kanto has at least 15 gyms as Gary who has 10 Badges has only 3 common to Ash (7 different Badges). Other Badges observed in the anime which do not correspond to known Badges suggest that there are at least 9 Gyms in Hoenn, 11 in Sinnoh, 14 in Unova (4 different from Cameron, 2 different from Trip), and 11 in Kalos (3 different Badges from Sawyer).